I am now 56 years old. Unbelievable, 56 years old. Just yesterday I was the overachieving new kid on the block. Now I’m the guy with six daughters, salt-n-pepper hair, five grandchildren and wisdom lines around my now droopy eyelids. I’ve discovered in, what I loosely refer to as “midlife,” that I am more irritable than I used to be. I am less tolerant and yet I find myself at times more, dare I say it, socially liberal than days gone by. Okay, I just lost 50% of my Baptist friends. I don’t mean theologically. I mean socially. I’m frustrated that we care more about a Hillary’s emails than Haiti’s starvation, are more passionate about college football than homeless people and more caring of our pets than we are of single parents or widows. And then I realize that I am the problem! I have become like far too many Americans. Comfortable in my irritability of my own comfort. Like all irritable people, I am often hard to love and have a hard time loving others. My attention is often consumed by being aware and driven by my circumstances. I find myself in a constant state of agitation, frustration and disenchantment by what is happening outside of my control. I feel heavy, burdened, stressed and weary. I don’t like being that way and hate admitting it to you. It makes me feel like the spoiled brat I probably am. When life doesn’t go my way, which seems to be often, I get fearful and it displays itself as irritable. My gray hair and wrinkles also reflect some good news in that I now recognize that God invites me to abandon all those fears and irritability – He invites me to leave my self and come to Him for rest in Matthew 11:28 . I can now leave my fears, my irritability, my frustration and my foolish self with Him because He promised that He came that I might have an abundant life in John 10:10 . Not a life filled with fear, pain and irritability. He set me on a path completely free from the dependence of circumstances for my joy. I now can bank on each day being filled with more joy and less irritability because of Him. That’s very cool. That is also a reminder that I am to redirect the personal energy that was once directed toward irritability and fear and direct it toward caring for others with a passionate heart of service and love for those that might be the most unlikely recipients of God’s love working through me. I am often reminded that God will allow my life to cross paths with a need that He desires me to meet and that I missed that blessing for decades in my irritable selfishness. May your day be filled with the blessed crossing of paths with those that you and you alone can bless. 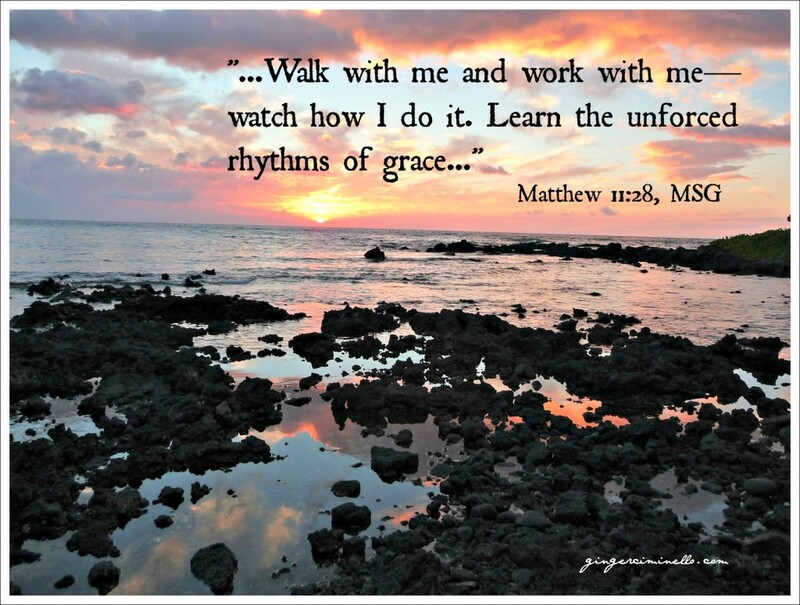 That is the “Rhythm of Grace”… God using us to fulfill His redemptive plan for this lost and broken world. Thanks for joining me this first week of my Weekday BLOG!